Kiev-based Georgian Khurtsidze (20-1-2, 13 КОs) defended his WBA Inter-Continental middleweight and EBA (European Boxing Association) middleweight belt by lucking into the best of all possible outcomes when he was awarded a dubious TKO victory in round 8 in a clash against experienced Uzbek middleweight Kuvanych Toygonbaev (30-6, 19 KOs). Both headlined «World Boxing in Cherkassy» fight card held by «K2 East Promotions» promotional company in Cherkassy Sport Palace «Budivelnik». Khurtsidze started aggressively as is his custom trying to fight from the inside. He threw a lot of fast punches which, however, lacked power. At first in round 1 Toygonbaev defended smartly studying his opponent but then starting from round 2 began to counterpunch. He threw fewer punches than Khurtsidze but they were heavier and more powerful. 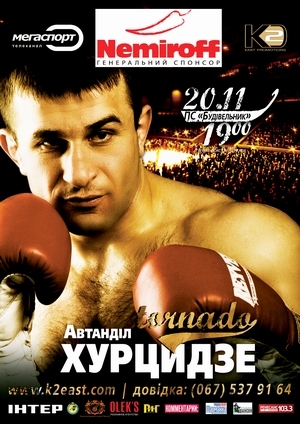 While Khurtsidze resorted mainly to left and right hooks Toygonbaev used long rights and uppercuts. It was a close fight with Khurtsidze slightly dominating especially after the fight passed the middle mark. The ending came all over sudden in round 8 when Toygonbaev was cut badly under his left eye after accidental headbutt. The cut was bleeding profusely and ring doctor after examining the gash recommended that the fight should be stopped early. Toygonbaev and his corner protested vehemently but all in vain. They became even more passionate when they heard the verdict – Khurtsidze got a TKO victory. The audience booed the decision since everybody knew that in such a case judges should go for the scorecards. Another headbutt happened in round 1 of the co-feature when Yuri Nuzhnenko (30-1-1, 14 KOs), former WBA World welterweight champion clashed in a ten-rounder against solid Russian journeyman Vyacheslav Yakovenko (7-8-1, 3 КОs). Nuzhnenko who planned sort of warming up in a tune-up fight before his title bout against Gianluca Branco for vacant EBU (European) welterweight title at the end of January suddenly had to fought two opponents instead of one – Vyacheslav Yakovenko and profuse bleeding from a gash on his forehead. %foto3%His cutman did his best during the breaks between rounds and Nuzhnenko went the distance. He established his jab and threw left hooks while Yakovenko mainly tried to counterpunch. Yakovenko surprisingly demonstrated a good chin when he was caught by several Nuzhnenko’s good left hooks, however, recovered quickly. Both fighters had their moments but Nuzhnenko was better one in the majority of episodes and finally got a unanimous nod from all three judges: 100-90, 100-90 and 99-91. Boxing video: Nikolay Israelyan vs. Alexander Subin We offer your attention fight video of Nikolay Israelyan (5-0, 4 KOs) vs. Alexander Subin (6-15, 1 KO). The fight took place at «World Boxing in Cherkassy» fight card held by «K2 East Promotions» promotional company in Cherkassy Sport Palace «Budivelnik» on November 20th. It was a heavyweight fight in which Russian boxer Nikolay Israelyan scored a fourth round knockout over Ukrainian Alexander Subin. Subin was dropped in round 2 but managed to recover and fought almost till the end of a four-rounder. But Israelyan dropped him again at the end of the fight and the referee waved the bout off. Boxing video: Mamed Yadgarov vs. Ravil Mukhamadiarov We offer your attention fight video of Mamed Yadgarov (14-5, 8KOs) vs. Ravil Mukhamadiarov (7-33, 6 KOs). The fight took place at «World Boxing in Cherkassy» fight card held by «K2 East Promotions» promotional company in Cherkassy Sport Palace «Budivelnik» on November 20th.